This remodeling story is a wonderful example of how removing and shifting walls can have an amazing impact on the functionality and visual appeal of an entire level of a home. 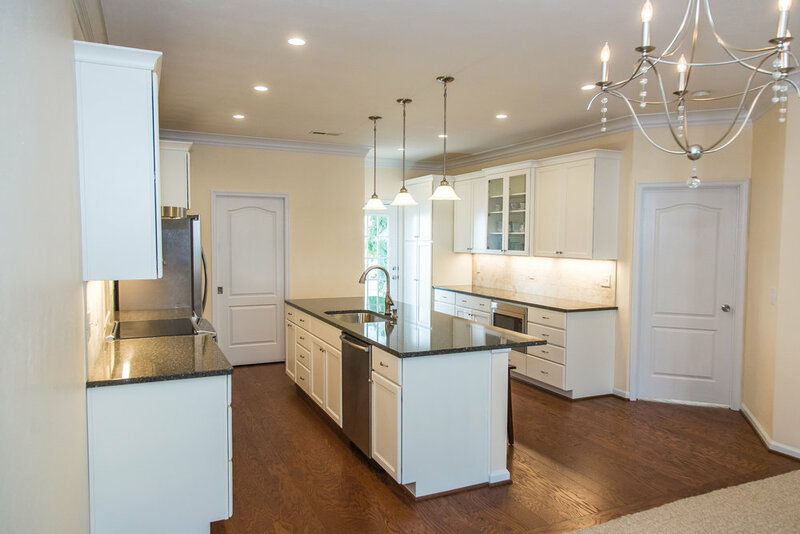 When our clients reached out to us, they were looking to create an open concept Kitchen that would allow for easy entertaining. The couple had recently purchased this townhome so his mother could be closer to the family. The existing floorplan offered first floor living, but the Kitchen was tucked in the back and was separated from the rest of the living space by a full wall with a small pass through into the Dining Room. Our design involved removing the dividing wall between the Dining Room and Kitchen as well as the fake columns and beam that separated the Dining Room and Living Room. The entire space was opened up to allow for easy flow and view throughout the first floor living space. The wall shared by the Kitchen and large Master Bedroom was shifted back just enough to provide a full wall of additional cabinetry including a much-needed large double Pantry cabinet. Now that we had opened up the Kitchen area we could focus on the cabinetry layout and selections. Clicking on the thumbnails will open up the slideshow. 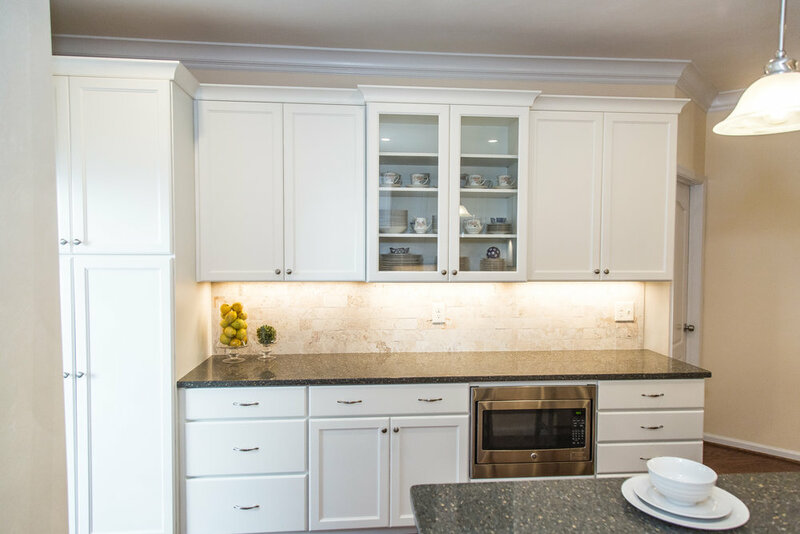 The existing wood toned cabinets were replaced with white with a crown molding to match with the rest of the home. 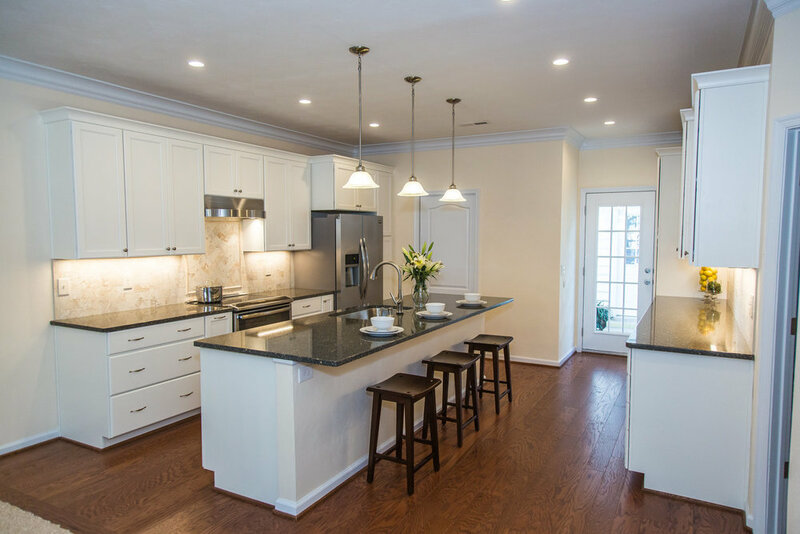 The larger, open space allowed for more cabinetry and the addition of an island with seating for the grandkids. We were able to repurpose the old cabinets above the washer and dryer in the adjoining laundry room and swapped out the existing swing door for a pocket door. The slate-look ceramic tile was replaced an engineered wood flooring that creates a sense of warmth and is very easy to clean. 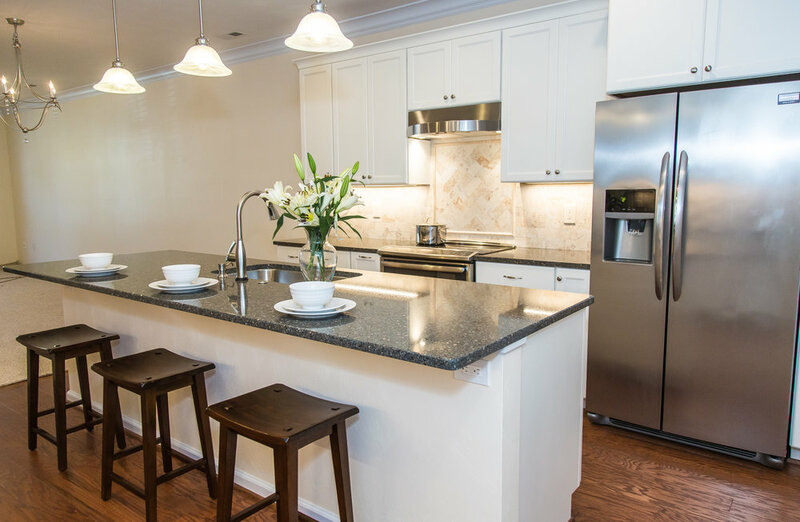 A dark Cambria countertop compliments the tile found in the dining and living area and a natural field tile backsplash offsets the cabinets beautifully. The single fluorescent ceiling light was outdated and did not provide adequate lighting for the new Kitchen. 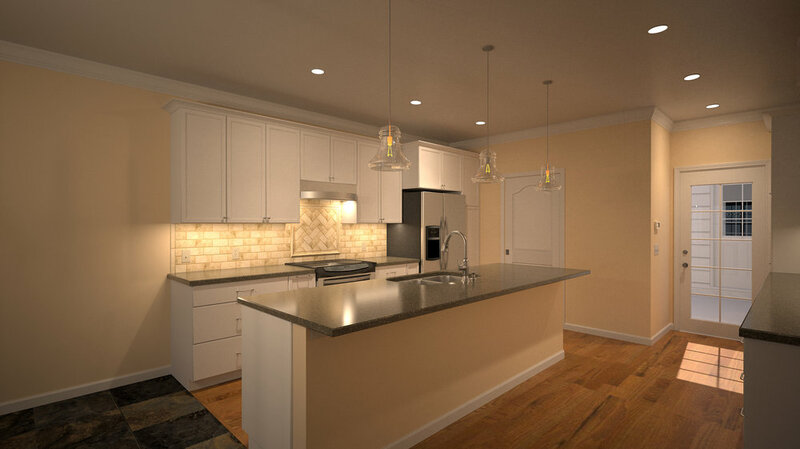 The new lighting plan was carefully thought out to provide general illumination through well placed recessed lighting; task lighting through pendant lighting over the island and under cabinet lighting; and aesthetic fluidity with an eye-catching chandelier for the Dining Room table. 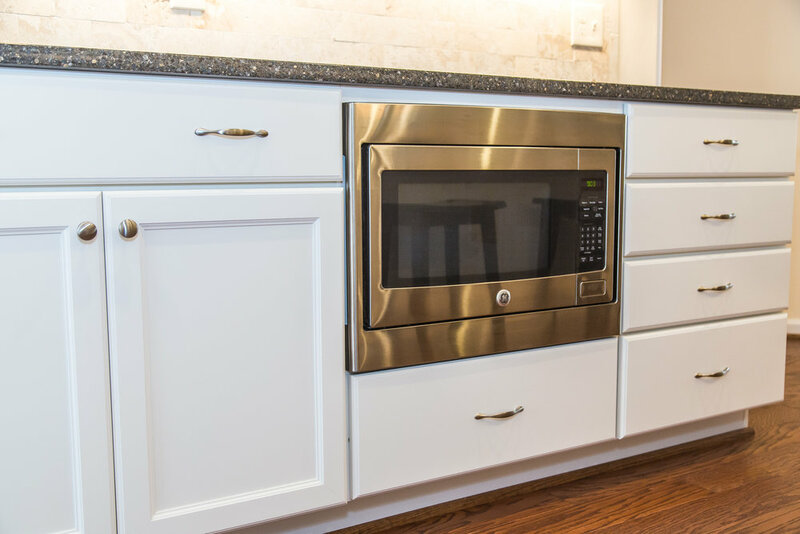 Special details include a touch faucet, under counter microwave and glass front cabinetry for displaying dishes. By removing and shifting walls, we improved the entire flow of the first floor visually as well as functionally and created a beautiful, light-filled space for cooking and entertaining. 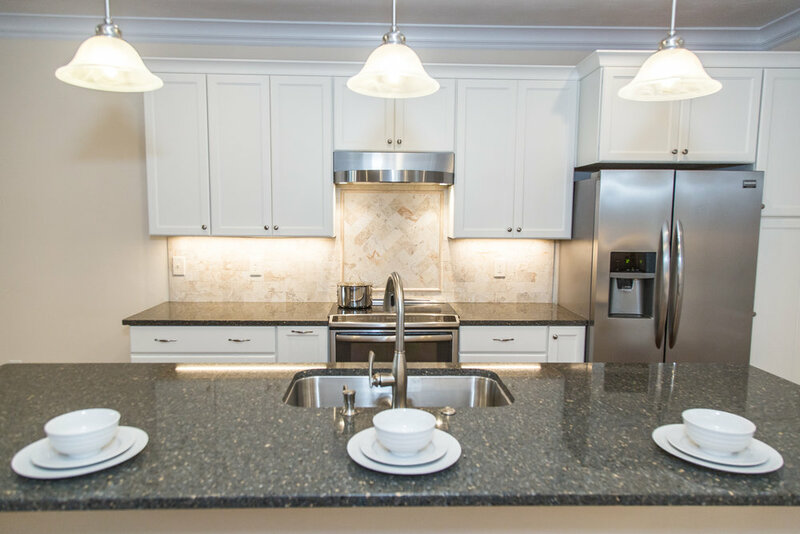 Grandma can easily prepare meals in her new Kitchen and still chat with her guests and grandchildren who love to sit at the island as well as in the adjoining Dining Room and Living Room. The Benson Homes team really enjoyed creating this space for this family and we hope they will enjoy spending time with friends and family for years to come.